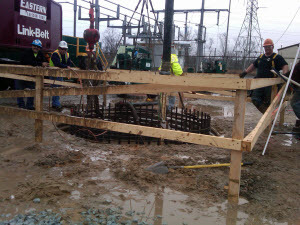 Eastern Caisson completed BGE Cell Tower Foundation on schedule for Teltronic Towers. This foundation consisted of one 10′ diameter by 48′ deep caisson which required being drilled using the slurry method. 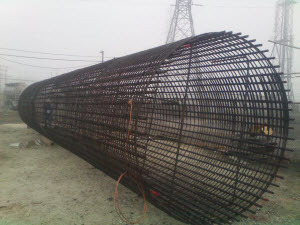 Eastern utilized its 100 Ton 218 Linkbelt with 165 Hain Drill Front attachment. Also, our 2nd 218 Linkbelt was on site to set the 9 Ton rebar cage at completion of drilling and our 28 Ton Grove Hydraulic Crane was used to assemble equipment as it arrived. Three 20,000 gallon slurry tanks were pre-mixed with drill product. Eastern’s crew arrived on site at 7 A.M. Dec. 5th and drilled to a depth of 12′. Eastern set a 10.5′ diameter permanent corrugated casing at the top and grouted around the perimeter. The drill crew then arrived at midnight to start the drilling of the remainder of the caisson. The drilling and slurrying of the caisson was completed by 7 A.M. Tuesday morning Dec. 6th. Jernigan Concrete pumping was on site at 8 A.M. with their pump truck and Shuster Concrete arrived at 9 A.M. with their first load of concrete. The reinforced steel cage was set in place and adjusted to grade and the pour began. 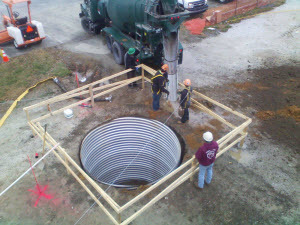 A 10′ diameter concrete form was placed in the top and leveled. Then, the anchor bolts were placed in the top 10′. 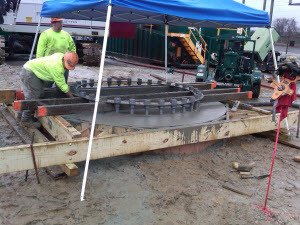 A total of 170 yards of concrete was placed to complete this pour. After the pour was completed, concrete was finished and covered with heat blankets for the night. Eastern is very proud of our crews on this project. In this project only 16 hours were needed to complete a 10′ diameter 48′ deep caisson with 170 yards of concrete. 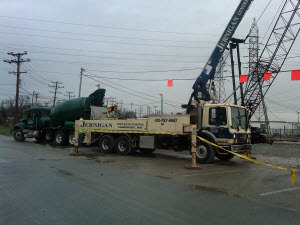 We at Eastern Caisson Corporation also very much appreciate the efforts of Jernigan Concrete Pumping, Schuster Concrete, and Cahill Excavating. Without their above and beyond efforts, this could not have been accomplished.